Odens Original Extreme Portion Snus is a classically flavored portion snus with a whopping 2.2% nicotine strength. This was the first of the Oden's EXTREME series of snus. 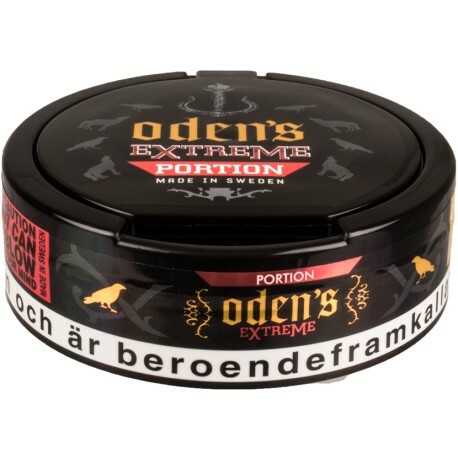 Oden's Original Extreme Portion Snus was introduced back in 2011 and is now a true Odens Snus classic. It has a peppery, citrus & bergamot taste, its very similar to XRANGE Strong Slim White and General One White, however it's not nearly as strong as the other two in the flavor department. So if you like the citrus bergamot taste but want it in a soft delivery you might like these. Despite none of the flavors being overwhelming it just doesn't taste good. I can't keep a portion in long enough to speak for the nicotine but I'm sure its there, though its a regular it starts out like a white (though most Oden's do seem more dry than other brands) so it takes a minute or so to really start to taste the flavor. I will be throwing this one away as I would rather just pick up some General White or Original from a local gas station then suffer through this until another order. A pretty quality taste of "regular tobacco" coupled with being fairly easy to bake or make a prilla or whatever you'd like to call it. Good nicotine content, not too overbearing and could easily be used on a regular basis, this coming from someone generally accustomed to wintergreen. It smells and tastes like industrial soap. For reference my favorites are General Onyx, General White, Skruf Los and Tre Ankare. My second favorite only to islay whiskey loose. I use odens original extreme everyday. Great taste and perfect nicotine hit. Highly recommend if you like how Copenhagen original USED to taste. This has been my go-to for a strong snus for quite some time now. I like the peppery tobacco notes, and it's always nice and moist. Clean, unmuddied flavor profile if you prefer tobacco to flavorings. My daily driver. I am new to snus and got this in the grab bag. it has a strong flavor that some might call an acquired taste but coming from straight and natural dips I dont mind it. As for the nic hit, can deffinatley feel it. I love this snus. Strong notes of pepper and an intense nictotine hit make this snus one to come back to. I'm always in favor of the extra strong snus varieties, and this one is probably in my top three. Will definitely buy a roll next time. There are other flavors too that I can't put a finger on.. This is an update to my 2012 review. A while back I made the decision to end my love affair with loose snus... mostly as a way to cut back and clean up my act. I still prefer loose but it's messy and I find I can hold a single portion in my lip a lot longer and end up using less product in the end. So over the last two years I've sampled many portions and have not come up with another product that I like better than these Oden Extreme Extra Strong portions. They are my go to brand and I like them fine. My only complaint is the can does not keep them as moist as it should due to a design flaw where the hinged top disposal lid creates air holes into the can itself. I have been seriously loving these lately. When Oden's Extreme first came out, I got a few cans and didn't really care for them. They have a very strong flavor and it took me some time to really process how good these taste. They have a great tobacco flavor, along with a little pepper. The Extreme portions and loose definitely taste a little different, so I would encourage everyone to try both. The nicotine is hotly debated amongst snus reviewers. I would say they are definitely strong, but not what I expected. Either way, I love Oden's Extreme portions because of the flavor and I would use them if they had 8 mg. I love Oden's extreme loose snus so I tried a roll of these portions with my last order. The flavor is no where near the same or as good. I can't believe they call this by the same name. Not only does it not taste the same, for a 22mg snus you hardly feel the nic. To simulate near the same effect as the loose I would need two of these portions. Now I'm half way through my first roll and I'm used to the taste - only because I'm all out of loose. Not for long though. I'll have to try a few more brands of portions before I buy these again. They're not terrible, just don't expect this to be Oden's Loose in a portion. Not the same animal at all.